Omron has recently launched its G5 Series AC Servo Motors and Servo Drives which are are said to be Industry's Fastest Servo Motor with High-speed Communication via EtherCAT Communications and Real-time Auto tuning and Advanced Vibration Control.According to Omron these new G5 series servo offers users the ability to design and manufacture more accurate, faster, smaller and safer machines. 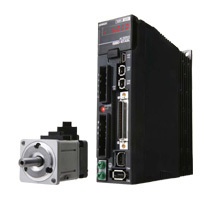 Three versions are available, with either an EtherCAT or Mechatrolink II network interface, or an analogue/pulse interface. This drive and motor is available up to 5KW and has a wide range of motor types. Subscribe to PLC, HMI Programming and SCADA Tutorials by Email. The model name for this servo will be R88M-K/R88D-K. In our Earlier post we have told I/O Connection and PLC Program For Omron Servo Drive to Run Through PLC so you can also check it if you want support on how to Program a AC servo. If you want to select your servo drive you can see below picture from Omron to Select Servo Drive. This G5 Servo series has servo frequency response of 2 KHz, which is far in advance of many drives available in the market. In addition, auto-tuning routines are simple to use, and vibration suppression functions are included to ensure the motor movement is controlled, smooth and settles in the shortest possible time. You can also Subscribe to Automation-Talk by Email for more Automation Industry news and Products.